Random factoid 2 : any self respecting archaeological unit or museum will tell you that they have hundreds of pieces of 'pot' - shards of broken pottery - which take up precious storage space and few are of sufficiently high quality to display publicly in large display cases, yet must be kept since they may be of importance to research. Not so long ago, I saw a museum that has made great steps in cracking the 'shard display' issue : they turned an entire wall of a hall into a journey through time displayed through pottery shards. It was a graphic and impressive journey through human crafting over time - and started me thinking about a possible craft project. 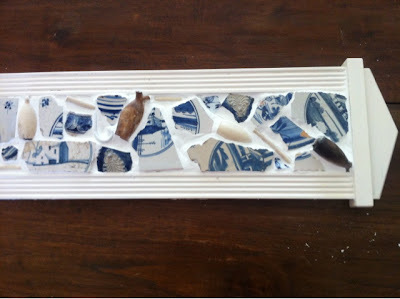 The Netherlands is one of the most densely populated countries in Europe, and this has left it's footprint in the soil : in many places, you can't dig your garden without finding hundreds of pottery shards, often in 'delft blue' or the trademark medieval greens and browns - as well as the remains of many clay pipes. This little treasure trove is just perfect for the piqué-assiette style of mosaicing and that's exactly what I decided to do. I used the back plate of an old broken pendulum clock bought from the Kringloopwinkel (recycling store) for pennies as my base plate. Since I had substantially more blue'n'white than green'n'brown shards, I painted the plate brilliant white with some left over household wall paints. I laid out a couple of trial layouts , allowing me to experiment with the balance of the shapes, and to decide on the individual display direction. Some epoxy based glue and some sticky fingers later, the final layout was secured into place. 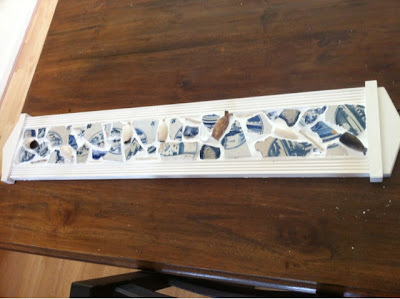 Then the fun part - filling the gaps with grouting. I used a pure white grouting - I know many professional mosaicists mutter about it looking like kiddie craft projects, but guess what - I'm a big kid having fun, and the contrast was much better given the large amounts of delftware. A night spent setting, and voila : a slice of Dutch life in a wall display.